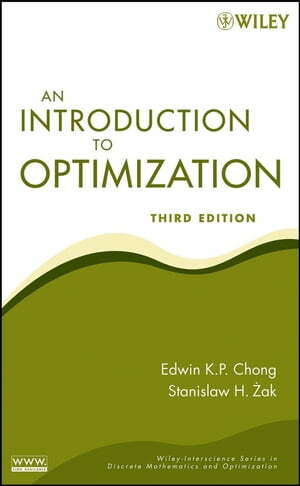 Collins Booksellers - An Introduction to Optimization by Edwin K. P. Chong & Stanislaw H. Zak, 9781118211601. Buy this book online. Optimization is central to any problem involving decision making in many disciplines, such as engineering, mathematics, statistics, economics, and computer science. Now, more than ever, it is increasingly vital to have a firm grasp of the topic due to the rapid progress in computer technology, including the development and availability of user-friendly software, high-speed and parallel processors, and networks. Fully updated to reflect modern developments in the field, An Introduction to Optimization, Third Edition fills the need for an accessible, yet rigorous, introduction to optimization theory and methods. The book begins with a review of basic definitions and notations and also provides the related fundamental background of linear algebra, geometry, and calculus. With this foundation, the authors explore the essential topics of unconstrained optimization problems, linear programming problems, and nonlinear constrained optimization. An optimization perspective on global search methods is featured and includes discussions on genetic algorithms, particle swarm optimization, and the simulated annealing algorithm. In addition, the book includes an elementary introduction to artificial neural networks, convex optimization, and multi-objective optimization, all of which are of tremendous interest to students, researchers, and practitioners.